Are you writing a personal story? Do you find yourself with questions or in need of motivation or clarity? Might an idyllic week in the French countryside help the process? A combination of practical support and peaceful inspiration? If so, this retreat is for you. Mindful Memoir is a week-long retreat housed in the glorious Château Marcoux featuring writing workshops with bestselling Canadian author Alison Wearing. 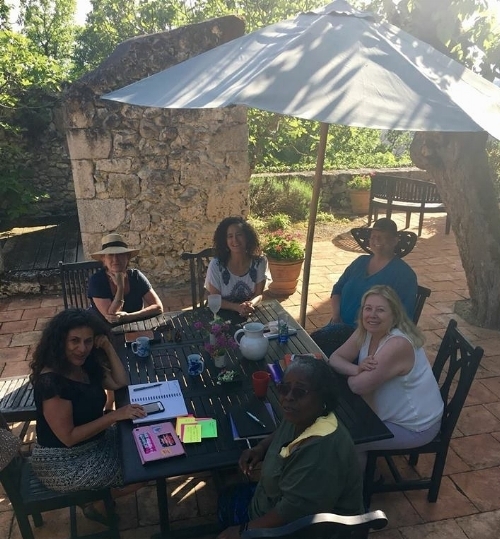 The retreat offers daily writing workshops, expanses of time for writing and reflection, optional yoga and meditation sessions, evenings of stories and readings, delicious and nourishing meals using fresh, local produce, and optional excursions into the surrounding countryside. A range of exquisite rooms and private suites are available at varying costs. The retreat is limited to 7 participants. 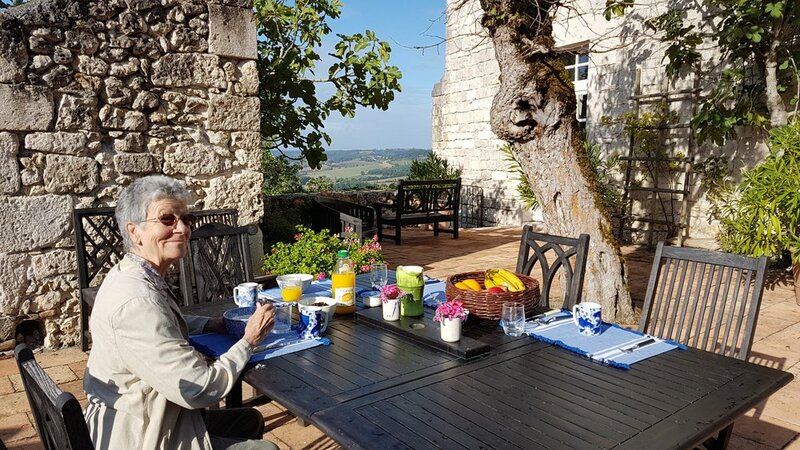 Our days will begin on the terrace of the château with a relaxed breakfast of fruits and yogurt, freshly baked croissants from the local bakery, coffee, tea and a spectacular view. At 10 a.m., Alison will offer a 3-hour writing workshop either in the cosy and comfortable living room of the main house or on the terrace, depending on the weather. In addition to offering the essential tools of memoir writing and guidance through common obstacles and questions, these workshop sessions will give participants an opportunity to share and receive valuable feedback on their work. An ever-changing menu of fresh, healthy lunches will be served on the terrace, followed by peaceful, free afternoons in which people are encouraged to cultivate a silent environment and devote themselves to their writing. Optional late-afternoon yoga and meditation classes and/or excursions to local markets and villages provide a beautiful balance to a day of sitting and concentrating. 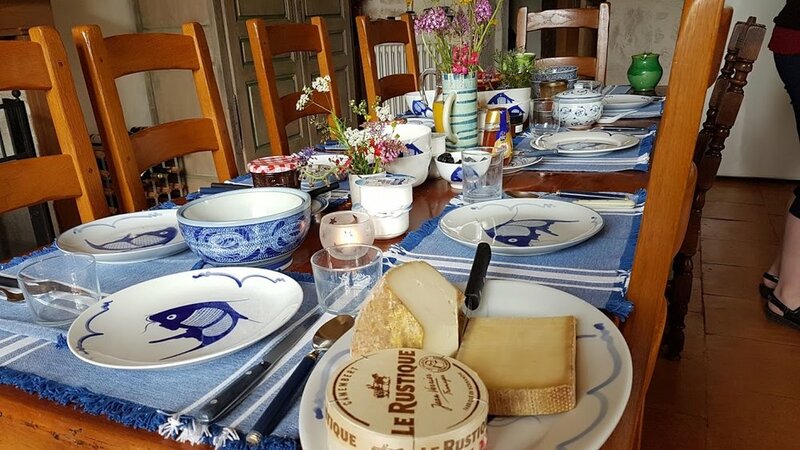 By the evening, we are ready to celebrate the day's progress over shared meals, conversations, stories, informal readings and, yes, excellent local wines. Our lives are woven of fascinating stories and experiences, but how do we transform those memories into a memoir? Many people decide to do a memoir writing workshop because they have a personal story they wish to write but they are not sure where or how to start. Others have been writing for a while but find themselves feeling stuck, overwhelmed or out of steam. I have had experienced writers come with a clear project in mind, or well underway, and a series of specific questions for which they need answers. Or sometimes a person arrives simply with a long-held dream to write their story, having decided that now is finally, finally, the time. No matter where you are with your writing, a workshop can help you. Enormously. Not only does it provide you with tools for structuring and sculpting personal stories successfully, a workshop can spare you unnecessary struggles and frustrations, provide clarity and critical answers, and offer the accountability and support (and laughter!) we simply cannot find on our own. * how to choose which of your innumerable stories to write about? * how to create a structure to contain the material? * how to transform your personal stories into something of universal interest? These are just some of the joys and common challenges to be found in chronicling one's life on the page, so welcome! Each of Alison's workshop sessions begins with an informal lecture and discussion about the essential elements of memoir writing. After that, everyone has the option of workshopping a short piece of writing (or an excerpt from a longer piece). Writing can be generated over the course of the workshop or be previously created. While virtually everyone is apprehensive about sharing their writing at first, guidelines for mindful feedback and a well-monitored workshop ensure that the experience is an inspiring, encouraging and clarifying one. The aim of every workshop is to provide each writer with fresh insights into her/his work, as well as the direction, focus, support and energy s/he needs to move forward with clarity and enthusiasm. All meals at Château Marcoux are included as part of the retreat. A mid-week excursion to a nearby village may include dinner at a bistro, which would be the responsibility of each participant, but all excursions are optional and a stay-home meal would be provided to anyone wishing to stay behind at the château. Please note: Rates do NOT include airfare to France (Toulouse is the closest international airport, but Paris is also an option) or airport transfers, though the latter can be arranged. Participants may choose to rent a car at Toulouse airport OR in the town of Agen (30 kms from Château Marcoux), easily reached by train. Pickups from Agen train station may also be arranged at a modest cost. All transportation options are explained in greater detail on the Contact page. Couples are welcome. A modest additional fee of 250€ will be added to the cost of the room for an accompanying spouse NOT participating in the writing workshop. If both parties of the couple are interested in taking the writing workshop, the additional cost becomes 600€. in order to write about them. "A joy from start to finish." "Alison's workshop was a joy from start to finish. I was delighted with her invaluable insights into organizing and structuring memoir material. She is incisive in her observations, yet unfailingly supportive and inspirational." "It’s not that Alison simply holds a mirror to reflect what you need to see within yourself and your writing; rather, it is as if she holds a body of water of immeasurable depth that allows you to go as deep as you need to find out who you really are and what you really want to say." "Alison's workshop was the key that unlocked my voice, the fire that lit my confidence and the sage that inspired my daily writing practice. Still going strong." "Alison's workshop is fantastic! She helped me to be brave enough to write, gave me validation and a sense that my stories could be unearthed and exposed to the light. I will always be grateful for her inspiring alchemy." "Alison's workshops are pure JOY."